Louisiana-Style Jambalaya with a healthy twist become Healthy-Style Jambalaya! I left out the andouille sausage and filled it with lots of veggies and brown rice. Bring on the beads and Mardi-Gras! Place chicken in a large bowl, season with 1/2 teaspoon salt, pepper and paprika. Let stand for 30 while preparing other ingredients. Then cut int 1-inch pieces. 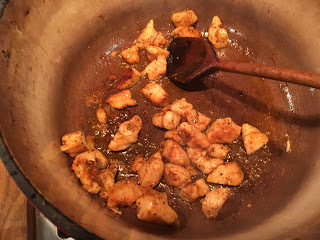 In a large, heat saucepan or Such oven, heat 1 tablespoon oil over medium. Add chicken, cook, undisturbed, 5 minutes. Stir; cook 5 minutes or until lightly browned on second side. Transfer chicken to bowl. And remaining 1 tablespoon oil to pan. Add onion, celery, and bell pepper. Cook 10 minutes or until tender and starting to brown, stirring occasionally. Stir in garlic and cayenne. Cook 1 minutes, stirring to prevent spices from sticking to bottom of pan. Add broth, increase heat and stir, scraping up any browned bits on bottom of pan. Add chicken and juices, tomato paste and additional salt (up to 1 teaspoon) only as needed. Bring to a simmer, reduce heat to low and cover; cook for 15 minutes, stirring occasionally. Add shrimp and increase heat to medium-high, bring mixture to a simmer and then reduce heat to medium-low and cook 5 minutes or until shrimp are nearly done (appear pink and opaque). Note: if using already cooked shrimp, add and heat only. Slowly stir in cooked rice. 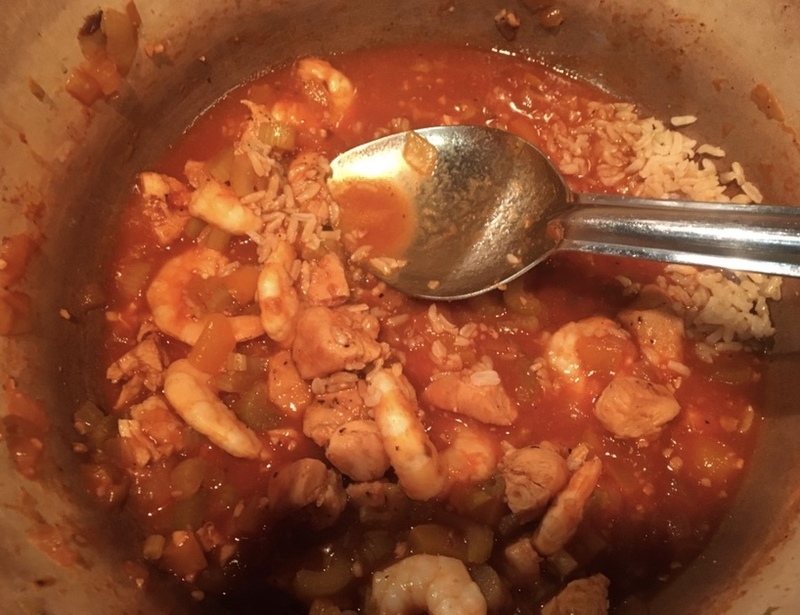 Add a little more broth if jambalaya looks dry -- it should be saucy, not soupy. Remove from heat, cover and let stand 10 minutes. Stir in parsley. Remove fro heat, cover and let stand 10 minutes. Stir in parsley.